THIS itinerary is $2,450 PER GUEST, DOUBLE OCCUPANCY. THE SINGLE ROOM SUPPLEMENT IS $300. THE DEPOSIT IS $750 PER GUEST. The natural beauty of the land and its rich, colorful history is what makes Cuba such a desirable destination. Come and experience the colonial Spanish architecture, UNESCO heritage sites, dramatic valleys, pristine beaches and rural communities that proudly open their arms to travelers. Cuba’s political history has created a mid-century time capsule where the 1950s American remnants and abandoned Soviet investment clash, a microcosm that only exists on this unique island. Combine all this beautiful country has to offer along with a class act travel agency to witness Cuba through our eyes! 8 days & 7 nights in Havana, Cienfuegos, Trinidad, and Bay of Pigs. Round trip airfare from the port of departure. Ground transportation within Cuba in vintage American automobiles. All accommodations while visiting Cuba (Private Bed & Breakfast with air-conditioned bedrooms and en-suite bathrooms). All meals are included (two national mixed drinks or beers with dinner). Please advise us about any restrictions or food allergies. Activities outside of the tour itinerary. Water sport rentals are not included. Baggage fees are common upon check-in at the airport. These fees are the responsibility of the passenger. Arrive at Jose Marti Airport, Havana, Cuba. Hola, Cubita Linda. After clearing customs and getting luggage we travel to the homes in order to get settled in and meet your hostesses before we begin our journey. After lunch we will embark on a panoramic tour of Havana in convertible automobiles: Plaza of the Revolution (Plaza de La Revolucion), Colon Cemetery, Botanical Gardens (El Bosque de la Havana), Fifth Avenue (5ta Avenida) and the famous seawall, El Malecon. The next stop is the Hotel Nacional, a historical luxury hotel, circa 1930. There are terrific views of Havana and El Malecon from the hotel. 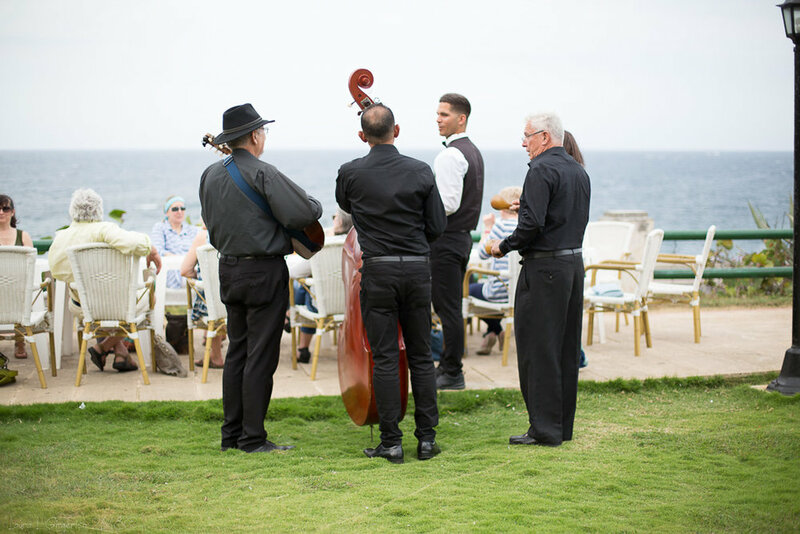 This is always a wonderful stop to enjoy a welcome cocktail and the live sounds of Cuban melodies. 8:00pm - Dinner is included: Chef Diego, owner of Los Balcones de Diego and recently awarded the International Culinary degree, is excited to share his favorite Cuban dishes. Enjoy a wonderful, outdoor themed dinner. Today, we tour Havana’s Old Town (La Habana Vieja), which in 1982 was awarded UNESCO Heritage Site status. You will walk through squares surrounded by the impressive baroque and neoclassic-style buildings that have made Havana one of the most architecturally significant cities in the Americas. Along the way, we visit The Cathedral Square and tour the inside of one of the oldest Cathedrals in the Western Hemisphere. This stop is a favorite of all religious denominations because of the building’s history and beauty. Next, we travel down Obispo Street which is one of Havana’s most populous streets. For those who wish to shop, this route is lined with stores from Bernaza Street to Plaza de Armas. Next we enjoy mojitos at the well known Bodeguita Del Medio, which was frequently visited by Hemingway. This is a great music and cocktail stop (guest expense for those who wish to partake) this early afternoon. 1:00pm - Lunch is included: D’Lirios. We then visit Finca Vigia, which was Hemingway’s home in Cuba and the location where many of his famous novels were written. Today, also home to his beloved boat Pilar. Rest in preparation for evening activities. Private tour of the Art Factory (Fabrica de Arte), a two story restored warehouse with a fantastic collection of Cuban art, along with national cocktails and live music. Dinner is included: El Cocinero Restuarante (Havana’s new happening place). 8:00am - Breakfast at your residence. This morning we travel to the east side of Havana to the town of Cojimar, a small fishing village, that is best known for inspiring Ernest Hemingway’s, "The Old Man and the Sea". This is home to a wonderful culinary experience today. The group will walk with the restaurant staff to see the Ogranoponico farm location, where the restaurant picks daily vegetables and spices for their meals. Along the way we will explore the little charming village, which remains intact to the time when Hemingway was a beloved friend of the people. We return to the restaurant and interact with the kitchen and the cocktail scene to learn how to create a very special Cuban dish. Enjoy the fruits of your labor at lunch today! Happy cooking at El Ajiaco! 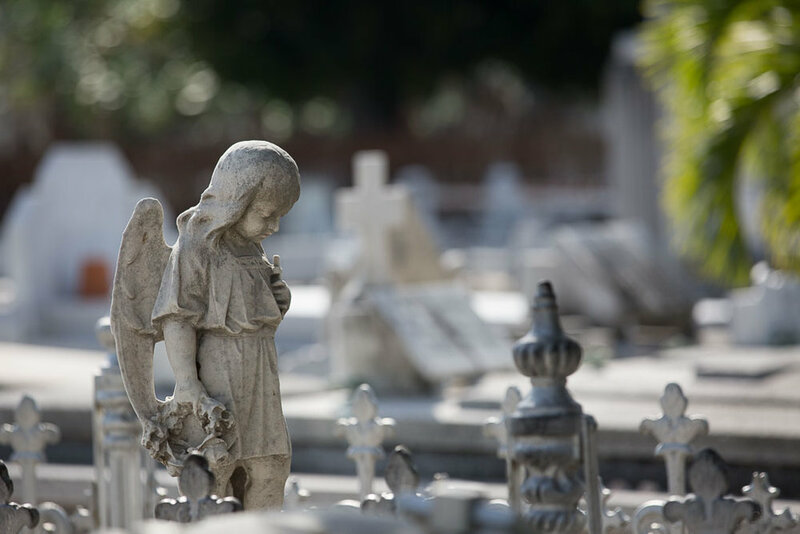 Tour of the Colon Cemetery, which is the largest cemetery in Cuba. Enjoy an afternoon stop at the Morro Castle Fortress for wonderful views of the city of Havana, the Havana Christ and the home of Che Guevara. Dinner is included: VistaMar Restaurante. Mid-morning arrival into the beautiful city of Cienfuegos, known for its colonial-era buildings and immaculately clean streets. Some additional exploration of this beautiful area before leaving Cienfuegos: Casual walk down Prado Avenue, the longest street in Cuba, known for its beautiful buildings and Marti Park. Points of Interest: Dominicas - Eliza Bowman, Maristas - Methodist Church, El Boulevard, Calle Cristina, Calle Tacon, Calle (Esquina) Zaldo and Cisneros. This afternoon's drive takes us to Trinidad, a colonial city that is a UNESCO World Heritage site. Take a casual walk in the upper side of the city and beautiful Central Park with music stops throughout the town. Dinner is included: Guitarra Mia. This morning we explore Plaza Mayor, the Bell Tower at the Museum of the Struggle Against Bandits, and the Mayor Church. Plaza Mayor is the town’s center, surrounded by the Mayor Church (1892), the Cantero Sugar Palace, and the San Francisco Convent bell tower which now dominates the town. Along this tour we will see many beautiful works of street art and hear impressive music from nearly every corner in this vibrant colonial town. Afro-Cuban visit to Templo Llemaya to learn about the Santeria religion of Cuba. Because for years the church communities were not open, the people of the country focused on the Santeria religion as a way to find hope. Visit to the Palacio Cantero museum and tower to overlook the city of Trinidad in all its glory and learn about the influence of sugar cane on this region. This afternoon our travels take us to the area of Guachinango, which is rich in history and sugar cane. Panoramic look-out at the Valle de los Ingenios (Valley of Sugar Mills) and the Escambray mountain range, a view that can only be explained after you have seen it. Lunch is included: Traditional farm style luncheon. Some free time this afternoon for shopping, small café stops or simply relaxing. Dinner is included: Café Tutti. Rumba drums with African rhythms and dancing at Calle Echerri. Throughout the streets of Trinidad at night, you hear the sounds and steps of the locals as they enjoy the rhythms of the Afro-Cuban music and salsa. The steps at the Plaza Mayor is known for live music at night and people watching. This morning we travel to the area of Bay of Pigs, the Zapata region of the country. Here time has stopped, the community where we will stay for the next two evenings is quiet and welcoming, the children still play in the streets, and the locals are out and about welcoming its guests. This afternoon is free to explore the community or to relax by the ocean. Snorkeling and scuba diving are options in this area. Dinner is included: Casa Alex. Very early tour of the flora and fauna, along with beautiful bird watching with a local guide. The scenery is quiet and beautifully situated among lush landscapes. Lunch is included: Beach side. This afternoon is free to relax and enjoy the area. Breakfast and preparation for airport departure. * Cocktails in excess of those provided in the package are the responsibility of the travelers. A deposit of $750 per person is required to guarantee your reservation, which will be applied towards the cost of your tour. Deposits are generally non-refundable, except in rare cases when we cannot confirm all components of a booking at the purchase price. Any pending balance must be paid in full at least 30 days prior to departure. If your booking falls within the 30 days, payment in full is expected at the time of booking. For those who wish, a payment plan can be established: One month after the deposit is paid, the remaining balance will be divided by the amount of months remaining in order to have the balance paid 30 days prior to departure.